The answering machine goes off. It's Ellie, trying to get a hold of Isaac Clarke. He doesn't answer. He's standing in a disheveled apartment located on a lunar colony, but it's not your typical bachelor pad type mess. It's dark, it's grimy, it's gross—it looks as if this is a cave, a personal hell which he has retreated to perhaps. As you muse over this, sergeant John Carver—the character your co-op buddies will play—bursts into your apartment, demanding to know if in fact you are the famous Isaac Clarke. 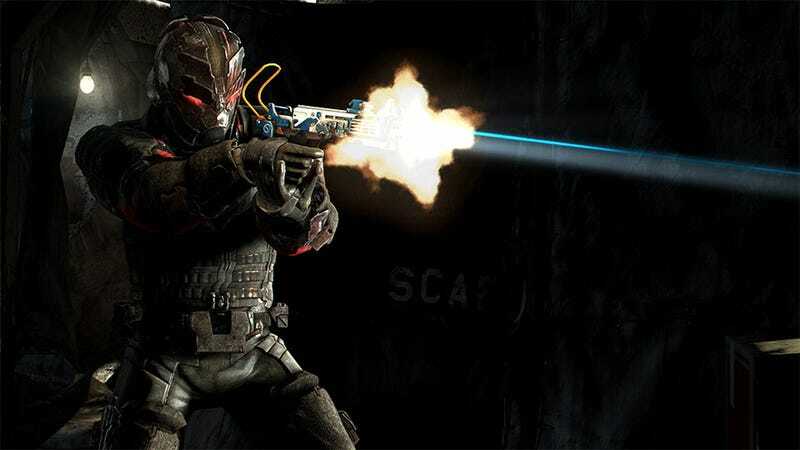 Carver and his acquaintance Robert Norton need your help in Dead Space 3. Guess what, the predicament involves a damsel in distress (Ellie, from the previous games) and it involves Markers—which is to say, it probably involves the horrific, reanimated corpses of the dead (otherwise known as necromorphs.) Great! Isaac wants nothing to do with Markers after the events of the first two games, but this involves Ellie, so he begrudgingly agrees to help. Naturally things have to get even crazier at this point, so this is where the overzealous Unitologists—the people who have formed a religion around the Markers—come in. Guns blazing, the Unitologists set out to look for you. The Unitologists are out to kill you, wouldn't you know it. This is how the game sets up one of the initial levels in Dead Space 3, which I experienced earlier this month. It's also where I discovered rolling and taking cover. Like most well-implemented rolling mechanics, it's a joy to move across levels entirely through rolling, but I can't say I ever used cover again outside this initial chapter in the ~3 hours that I played Dead Space 3. My first time going through, I didn't feel there was much that was notable Chapter 1 beyond the lunar colony having a similar look and feel to that of Mass Effect's cities. You'll also come face to face with the man that I assume is the leader of the Unitologists, a silver-tongued charismatic fellow that tells you all about his sinister plot with the Markers. He intends this information to be the last thing you experience before death. He doesn't manage to actually kill you, of course; you narrowly get away. Ellie? Eh, I didn't really care. But she's there, if that interests you! But this continues the larger narrative in Dead Space, which addresses the role of the Markers and necromorphs in society—and, admittedly, was much of the reason that I kept going forward in the preview. Ellie? Eh, I didn't really care. But she's there, if that interests you! I was new to Dead Space, you see—there wasn't much about the previous games that captured my interest. I'd initially avoided Dead Space because I'm not much for scary or tense games. When it was clear that I was going to preview Dead Space 3 I tried looking up the science of the jump scare—which I heard Dead Space was full of—to try to soften the blow. If fear stems from the unknown, then knowledge helps, right? Haha, yeah okay, like Wikipedia pages were about to lessen the terror of WELL TIMED LOUD SOUNDS and NECROMORPH BURSTING INTO THE FRAME UNEXPECTEDLY. Making things 'worse,' Dead Space 3 likes to put you in tight spaces without too much room to maneuver. Even if you see the necromorphs ahead of time, it's likely you'll often find yourself nervously backpedaling while trying to reload, necromorph viciously trying to swipe at you. Hopefully you don't get backed into a corner! This is where rolling comes in handy. Personally, I found myself frustrated at the difficulty on normal, especially later in the preview when juggling one of the game's 'puzzles' (if you would even call them that) with necromorph waves. I died more than I felt I should have. But with a buddy? Things felt much smoother, much more fun—though admittedly I felt jealous that Carver had the cooler black and red suit. Grr. Ah well, it's probably appropriate. It seems that you and Carver will have a complicated relationship thanks to how harsh Carver is. When you apologize for something, he angrily tells you to try harder next time for instance. Anyway, there is a bit less tension when you know a friend will have your back with a pesky necromorph, and it wasn't uncommon to double-team enemies. One person suspends the necromorph, and the other rips it apart sort of deal. Co-op presents a wonderful opportunity for more nuanced tactics, and Dead Space 3 isn't any less engaging when you cut some of the anxiety out. The game remains just as chunky and visceral as it has in the past. It was through co-op that I also learned how much Dead Space 3 rewards exploration. My buddy liked to go off and meticulously search through the levels for artifacts. Sometimes, this will mean taking a closer look at a seemingly empty room that's right along the way. Sometimes, it'll mean going deep into space while navigating outside of a ship. Sometimes, it'll mean shooting down something in the background that doesn't seem as if it holds anything—like maybe a deer head. I was impressed. Isaac is an engineer, right? He's smart and uses his intellect to solve problems, yes? Crafting is justifiable by the story, then. While I didn't find too much to tinker with, my co-op buddy seemed to find all sorts of materials and his weapon looked intimidating, beastly and effective. Isaac is an engineer, right? He's smart and uses his intellect to solve problems, yes? Also included are side-missions and optional objectives. Toward the end of my preview, for instance, I had a choice between two locations depending on which mission I wanted to take up. Unfortunately the demo ended right there, but it's obvious that Dead Space 3 is incorporating modern design elements that all games have to have nowadays like Choice and Customization and Social Play. I swear that I find it difficult to tell if these things actually improve an experience rather than giving us stuff to cross off a universal games checklist. However, I can concretely say that Dead Space 3 felt much better with a friend than it did playing alone, though I was sad to see little of Carver's supposed compelling storyline. Alas! Dead Space 3 releases on February 5th in North America, and February 8th in Europe.